Bangladesh’s High Commissioner Riaz Hamid-ullah yesterday expressed confidence in finalising the Free Trade Agreement (FTA) between with Sri Lanka within the year, aimed at improving bilateral partnerships. “Once this is done we will develop joint recommendations for the formulation of the agreement,” he said, speaking at a discussion organised by the Sri Lanka Bangladesh Business Co-operation Council at the National Chamber of Commerce. The proposed FTA is more focused on the service sector not goods and aims at plugging into the global supply chain. “This should go beyond bilateral trade between the two countries,” he said. Calling for strategic partnerships between business entities in the two countries to focus on a larger market, taking aim at the regional and global supply chain, Hamidullah said that the FTA would complement such alliances. “The time has come for the two countries to form joint ventures in sectors such as apparel, IT and construction. The strategic partnership in the apparel industry will enable business entities to plug into global supply chains and this is the same in sectors such as IT as well,” he said. The High Commissioner also invited proposals and recommendations for the FTA from the business council. Speaking of the development of his country’s economy and infrastructure, Hamidullah emphasised that trade ties with Bangladesh were not just limited to its market but were connected to global and regional trade. 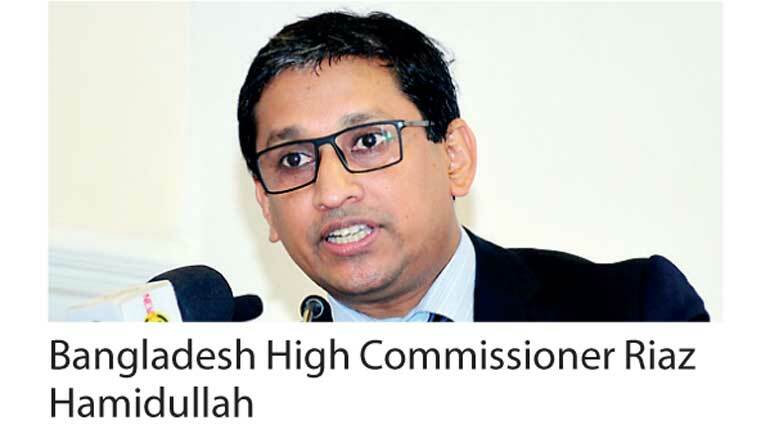 “Bangladesh is becoming more connected in its economic landscape and its physical landscape is also becoming a lot smoother, connecting the country to the regional market,” he said. Further, the good relations the two countries shared and the facilitation extended to Sri Lankan investors by the different governing authorities has made the country an attractive option for investment-related partnerships, Hamidullah said. The investment of $ 100 million by LAUGFS Gas (Bangladesh) Ltd. in the Mongla Port testifies to the good investment opportunities present in Bangladesh for Sri Lankan investors, he asserted.